As a warm weather loving gal, I can’t think of anything that helps me get through the cold like being covered in a warm and cozy blanket. This new vintage make of mine is simply a wearable version of that same toasty idea with my bottom half wrapped up in a plush cover. The year 1956 provides a chic and streamlined style for sporting coat weight wool as a skirt and fighting off the frigid temperatures – my kind of combo! My post’s title is funny yet literal. The back of my pattern envelope announces at the top, “Slim, versatile ‘Wonderful Whiz-Wrap’ skirt is ‘Simple-to-Make’ and can be worn in front or in back…” To me, that sentence sounds just like a catchy selling tagline, but I like it and find that my skirt’s nickname makes me smile. Really, though, how could you get anything better than a skirt that can be this easy and versatile? It is able to be worn with the opening in front or in back, can be made in any kind of fabric and weight under the sun, and something that just wraps around you to go on in less than a minute. FABRIC: My fabric is a thick and plush wool and acrylic blend in a black plaid with lines of green, white, and red. The fabric has a loose, open weave which creates a lofty feel, trapping air and keeping you warm! NOTIONS: I had everything on hand: brushed satin-finish poly pongee lining in black, large coat snaps, waistband hook and eyes, thread, and bias tape for the hem. TIME TO COMPLETE: From start of cutting to the finish of sewing, the skirt was done in 3 hours on November 16, 2014. However, the final hand-sewn closures of the snaps and such was a bit time consuming, taking maybe 2 hours in itself. THE INSIDES: This skirt is so beautiful – inside and out. 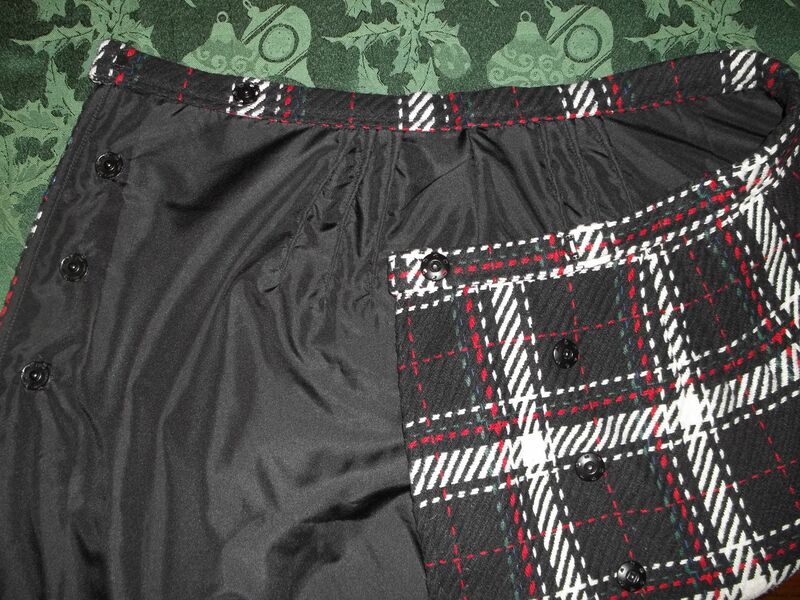 It is completely lined and every seam is hidden in either the waistband or lining. The bias tape covered hem is such a fun and perfect touch – bright and cheery green to provide a surprise when the wrap opens up. TOTAL COST: This fabric was bought at Hancock Fabrics during a ‘sale-on-top-of-a-sale’ discount time. I bought about 2 1/2 yards, but only used half of that for my skirt. So, with my fabric cost being only $1.50 a yard, and all my notions on hand, my skirt only cost me about $2.25. Wow! Vintage patterns really have things right. The more I use them the more I am amazed. For example, how can a skirt effectively fit both in front or in back, I wondered. This “Whiz-Wrap” skirt employs a dozen tiny darts, grouped in sections of three at the four off center positions, to shape my rectangle of fabric and discreetly save it from looking like a shapeless box. Curvy side seams also help shape this wrap skirt, and are an added boon for someone like myself who happens to be graced with power hips. Unlike the 1960’s “Jiffy” patterns (which I find have sloppy, unpredictable sizing), these “simple-to-make” 1950’s patterns are actually unbelievably tailored, incredibly smart, and luckily easy to find. I think the long, open flap of the wrap added a little ‘hottie’ factor, keeping this skirt from being too formal or dumpy, especially when the opening is worn at the back. See my picture – ah, hello! A little bit o’ leg peeks out more when the wrap opens at the back than it does from the front, but either way I think it is just enough. (Just enough to show off my bright green bias tape on the hem!) Anyway, if the skirt was closed down any further if might not be as extremely easy to move around in as I find it. For being a very easy to make pattern which doesn’t require much fabric, a dozen darts are a lot to sew when also adding a lining. I figured out a way to both: 1.) ease the “pain” of doing 12 time-consuming darts and, 2.) simplifying the pattern even more by thinking ahead to use the lining fabric to work in my favor. Let’s address #2. The original pattern has four pieces: skirt front, skirt back, waistband, and skirt front (right side) facing. Firstly, the skirt ‘back’ pieces were sewn at the side seams to the wide skirt ‘front’ piece on both the lining and the wool plaid to make two big rectangles. Next, the facing along the right flap opening was eliminated by sewing the lining to the skirt at the vertical wrap edges, turning right sides out, and top stitching. I did still cut out an identical piece of the front right facing out of interfacing and iron it to the inside so the wrap would be stabilized. I also sewed in seam tape most of the seams as well. However, not having facing to the right front of my wrap skirt got rid of what would have been way too much bulk and fuss, saving me time and streamlining the look and fit. Now for #1. According to the pattern, you would sew all those 12 darts in as the very first step to do. Yikes – a dozen sewn on the skirt fabric and another dozen sewn on the lining…24 in total! I was not doing that (although I would if needed). Thus after doing the steps I explained in paragraph above, my skirt’s lining and fabric were basted together at the bottom hem and waistband edges, and only then did I sew in all 12 of the darts as if sewing on one piece of fabric. Can you picture it? Remember the wrap edges that go down the length of my body were already finished. I guess I took a sort of cheater’s way to sewing in my skirt’s darts, and it probably would have looked nicer to have those darts covered and invisible. But, hey, sewing is supposed to be fun after all, and if I’m happy doing this round-about way to get a garment done fast and finished well, then those sewing scales which balance enjoyment and quality have been leveled out. I did not use buttons for the closure, opting for heavy duty, large, black coat snaps instead. I fully intended on wearing this skirt both in front and in back like the pattern offers. There was no way that wearing the skirt with the wrap open behind you would be at all comfy with buttons – just imagine three or four uncomfortable, hard knots digging into the skin whenever you sit! Also, I was not enthusiastic at the thought of making some very large buttonholes in the fabric to match the large buttons which would be needed to support such a thick wool. Snaps are much less permanent when it comes to fitting and easier to sit on than buttons. My pattern’s size is actually a size which is a tad too big for my measurements. In the end I think that going larger works well for this skirt – this way you get a little extra overlap so the wrap doesn’t come open as easily. I just disregarded the markings for where the skirt is supposed to close and made it precisely for my own measurements by pinning it around myself and seeing what feels comfy. 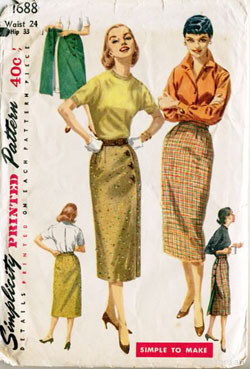 Unfortunately, I was not able to find much about my skirt pattern’s “Wonderful Whiz-Wrap” name, but I do have a handful of other patterns from this same year (1956), and find most of them to be of the “Simple-to-Make” kind. Perhaps, (I would like to imagine) this phrase was given to this pattern because the company/designer that it came from thought that it would become popular, widely bought, and widely made…like the famous “Walk-away” dress of 1952 (more info here). Maybe even the “Wonderful Whiz-Wrap” was a copyrighted jingle like the 196o’s “Wrap-arounder” dresses (see my version here), or perhaps nothing more than just a really good descriptive alliteration. My skirt might be a tad too long to be an authentic length for it year of 1956, but I don’t care. It’s just how I like it. 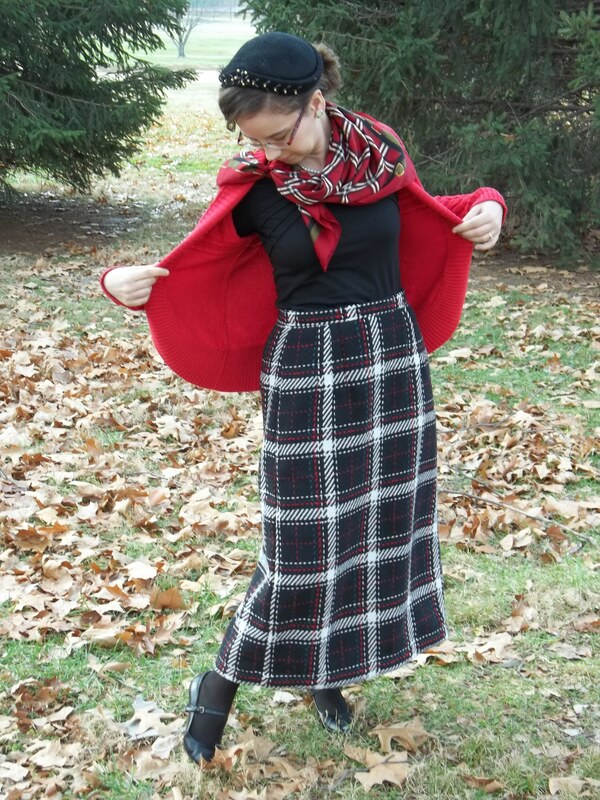 I do have the idea of making this skirt again in a version that is totally reversible, or at least making a shorter version in a basic “go-with-all” fabric and color. 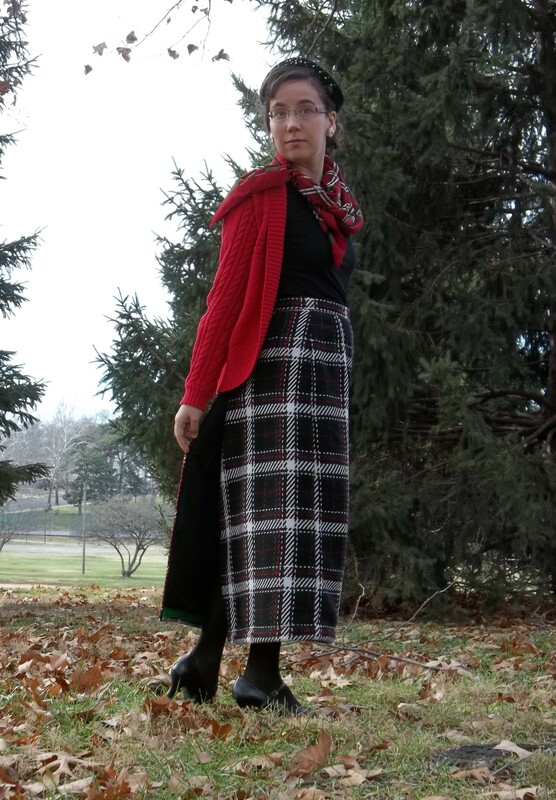 This wrap skirt was a good test of what my old Brother sewing machine can handle, and from the ease with which it sewed through this thick wool like butter, it gives me confidence to plan on tackling more challenging fabrics. I will have more pictures of this easy vintage winter separate posted on my Flickr page soon. 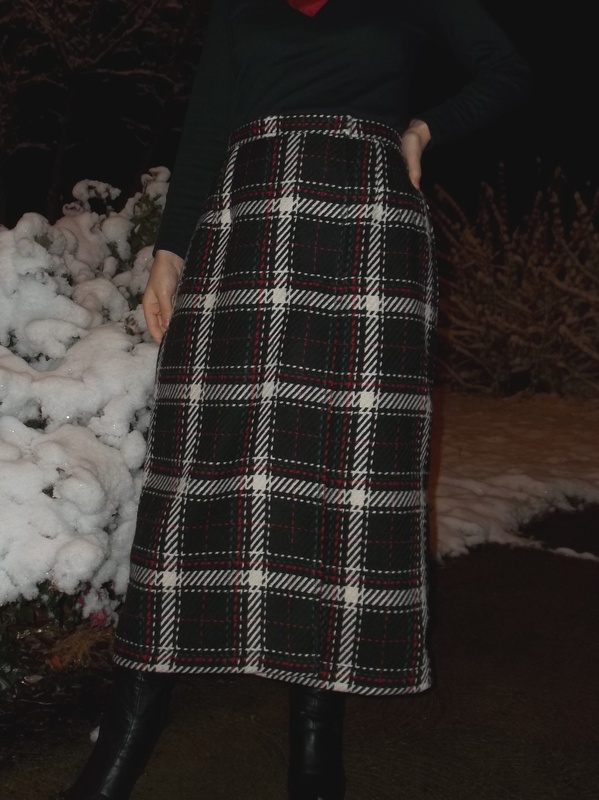 This entry was posted in 1950's and tagged "Simplicity pattern", 1950's, plaid, retro, Simplicity 1688, skirt, vintage, wool by kellycb. Bookmark the permalink.